We (about one hundred) women from the Berlin women’s center were taking a big chance when we rented a hall for 2,000 people in April 1974. This would be our first public women’s party. 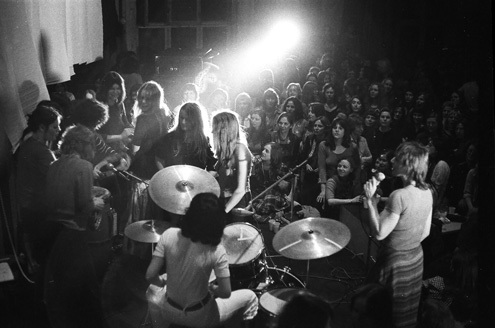 Instead of listening to songs by the Rolling Stones—such as “Under My Thumb”— women would play their own music for a change: The women’s party hosted one of the first appearances by Ina Deter (who still accompanied herself on the acoustic guitar in those days), and it was the premiere of the Flying Lesbians—the first women’s rock band on the European continent. Up to now it had always been men on the stage. Men defined the mood, male bands fired up and excited the crowd, men had the power. It is hard to express in words what it meant to us women to see women—people like us—on stage: women blasting out rock riffs, pumping up the amps, bashing the drums and making the crowd go wild. On this evening women from the audience clambered up on stage and one after the other improvised their own personal blues songs, shouting everything out, and the audience screamed along with them, fascinated by the intensity of a communal musical life, akin to that of a joyful gospel congregation. We had to guard the entrances; men kept trying to force their way in. At that time most men did not accept the idea of women going out on their own. Many women also doubted whether they would even have any fun at a dance without men, and were flabbergasted by this novel and dazzling experience. After the great success of the first women’s party, we repeated the form and used it to publicize current topics such as the Tribunal Against Violence. 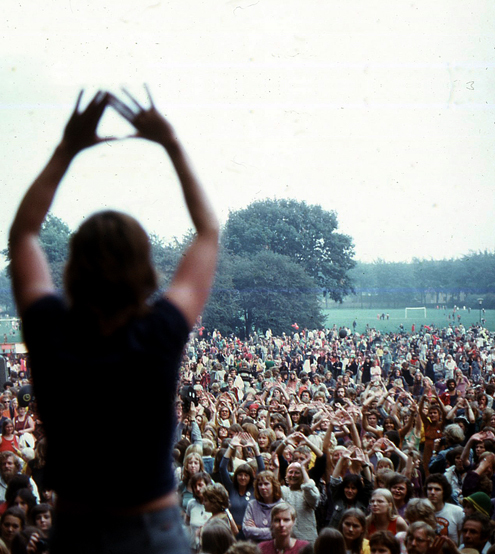 The dance parties were not organized by a “festival group,” as would be the case after 1981. Each of them was a community effort, individual groups signed up for specific tasks and the profits went to the Berlin women’s center or other projects agreed upon in advance. Poster for the Tribunal on violence against women in gynaecology, psychiatry, marriage, at work and in the media. The photo shows Emily Pankhurst beeing carried away by policemen. What is a rite of passage? Rites create and affirm identity and help to unite and affirm groups; rites of passage and initiation accompany and shape the “crisis” of transition to a new identity, a new group or a new status. The label “Women Only” proved provocative in the positive sense of the word. Women detached themselves from the male and “mixed” world and entered a women-only space. Many women came who would normally never have entered a women’s center. Heterosexual women had a reason—or an excuse—to go to a party without (their) men. In the narrower sense, entering the party venue marked the liminal state, the walk over the threshold, the 50 or 100 meters from the ticket table to the hall. In the figurative sense, this state could naturally persist in the presence of ambivalent emotions. Newcomers often felt a certain disorientation at first, confusion and agitation: straight women were confronted with lesbians, there was a sense of possibility in the air, but also of vague anxiety and excited curiosity. According to the cultural anthropologist Ina-Maria Greverus, “true rituals” are characterized by a process of the dissolution of boundaries. In fact, at the women’s parties and festivals there was a partial dissolution of the boundaries between spectators and performers, audience and stage, especially late at night, when—however only at the early parties, later we feared for the instruments—women stormed the stage en masse to drum along and sing their own songs. Everybody was allowed to take the microphone or the keyboards. Women in the hall drummed on every conceivable object. At one of the later festivals, and with a different band, she remembered the festival-goers beating on bottles and glasses as if in a trance until everything burst, and they finally found themselves sitting happily in a room strewn with shards. Rhythm, dance and texts: The Flying Lesbians acted as rock shamans and initiation godmothers who recited the “sacred texts”—the slogans of the women’s movement—as precentors; the dancers developed free forms and patterns of movement, individually, in pairs, in ever-changing groups, in circles and spontaneous lines moving through the event space. The women’s festivals made tangible the importance of separatism, of male-free spaces, for the dance of liberated life [the German original, Tanz der freien Verhältnisse, is a play on words since “freie Verhältnisse” can mean both “liberated relationships” and “liberated conditions” more generally]: to be able to dance without gawking men, half dressed, to get drunk without danger, to present or experience eroticism, and to realize how much fun one can have among women. Women’s festivals were in many senses coming-out parties. The term comes from the USA and refers to debutante balls where young women about to enter adult sociability are introduced to [high] society. 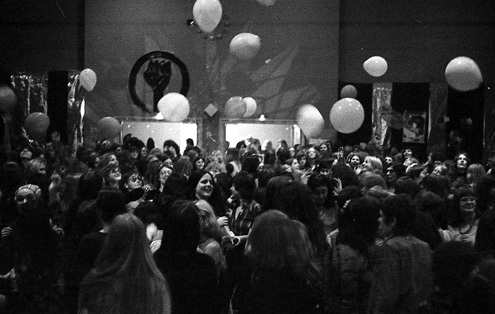 Women’s parties and festivals were where women’s society and women’s culture formed. Here women from various scenes entered women’s (movement) circles for the first time—women from socialist groups, students, white collar workers, artists and also women from political parties and trade unions, and presented themselves in a female public space. Straight women encountered lesbians and vice versa. Lesbians emerged from their hiding places in the bars, in the provinces, in isolation and left behind the notion that they were the only ones around. “They could present themselves with self-confidence on the dance floor!” (Monika Mengel). [i] Cillie Rentmeister, “Frauenfeste als Initiationsritual,” in Heinrich-Böll-Stiftung und Feministisches Institut (eds), Wie weit flog die Tomate? Eine 68erinnen-Gala der Reflexion, with an introduction by Halina Bendkowski (Berlin, 1999), pp. 118-40. For more information see the websites www.flying-lesbians.de and www.cillie-rentmeister.de. [ii] Rentmeister, “Frauenfeste,” p. 118. [iv] Miriam Frank, off our backs, Sept. 1977, p. 15. [v] Rentmeister, “Frauenfeste,” p. 136. [vi] Der Spiegel, May 1974, p. 54. [vii] Rentmeister, “Frauenfeste,” pp. 130–34. [viii] Ibid., pp. 135, 136.